In honor of this day commemorating love, I wanted to share the images on these cards I have from the 70s. They have that fun plastic covering on them that makes them shiny! I hope you all spend this day and every day feeling loved! But hotel note pads are not the only paper products I have picked up. I am working on some posts about my recent stationery adventures in Geneva, Switzerland and London, England and I have some other stationery adventures I’ve been meaning to post on Boston, San Francisco, New Orleans and elsewhere. It’s coming! My dad gave me his favorite magazine from his childhood–an issue of The Leather Craftsman dated September/October 1959. He always loved the image on the cover and the accompanying story that someone had written from the perspective of the cougar. I love that the image is all tooled in leather! Look at that detail! I have been thinking about ways to move from artist to salesman, of designing my own stationery and selling it online and at craftshows. But as the “feet” concept suggests–it’s a lot of work to do when you already have a full-time, non-stationery related job! Since my trip to the National Stationery Show in May, I’ve been thinking about the trend in the industry away from letter sets and toward cards only. I walked up and down aisle after aisle, looking in hundreds and hundreds of booths. I saw thousands of cards and fewer than five letter sets. I’ve heard from pen pals that they don’t find letter sets in stationery stores any more. They have to go online and find folks who still believe that we have something to say that won’t fit in a small card. There are some companies that still do fun letter set designs (I like Peter Pauper Press, Crane and Chronicle). And there are a lot of great Asian letter sets out there. But it feels like there may be room for me, too. I may jump into the fray. If it get up the courage, you’ll be the first to know! I just printed off my boarding pass for my early flight tomorrow. I’ll be at the National Stationery Show Monday and Tuesday and will share my findings when I return. I’ll be posting more regularly on Twitter @savesnailmail while I’m at the show, so please follow me if you’d like an inside perspective. In the mean time, I wanted to share some vintage stationery that my mother-in-law found in some of her mother’s belongings. She gave them to me. She thought they would make me squeal with delight and she was not disappointed! These Wildflower Floral Notes were designed by the Tichnor Brothers in Boston. I’m not sure how old they are, but I think they’re at least 50 years old. I assume that’s a mirror she’s looking into (telling it her biggest secrets). Either that or she’s headed off on what will be an unsuccessful butterfly-catching expedition. And is she a fairy or an angel? With wings like that, what do you think? National Stationery Day–in the U.K.
Britains have their priorities straight…they have designated April 24th as National Stationery Day! I don’t think we Americans have our own special day just yet, so I’m celebrating with the U.K. until we catch up. 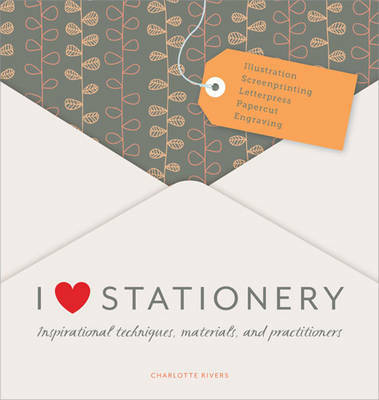 To mark the day, The Guardian featured a slide show of unique stationery designs from a new book by Charlotte Rivers called I Love Stationery. Guess who has already ordered the book?! National Letter Writing Month in the U.S. is from April 1 until Mother’s Day–so we have a lot to celebrate this month. Keep writing–and don’t forget to include a note to your mom. She’ll appreciate it. So, I promised myself that I would not buy any stationery this year until I had used up (or very significantly depleted) my current, somewhat embarassingly large, collection of stationery. I have kept that promise for over a month! But it’s sooooo hard when I keep seeing these lovely sales all over the place. A girl can look, can’t she? So I thought I’d just share a couple sites I’m drooling over right now with you and then I can move on to using all of the gorgeous stationery I already have! Night Owl Paper Goods is having a big sale on their lovely letterpressed and wood (yes, wood!) stationery. Crane has had some items on sale (slowly dwindling before my eyes!) but this airmail journal is still available for only 5 bucks (pic from Crane)! And I have been avidly perusing European Paper Company’s lovely selection of, well, European paper. Fortunately, my stationery purchasing ban does not extend to those people who have given it to me as gifts lately; I have a few new treasures to share, soon! P.S. Crane’s website has some great “how do they do that?” videos. I loved watching this man gild the edges of a stack of cards. Wow! I love that “Statler Hilton” script. I’ve been practicing those H’s with my calligraphy pen! I love that the luxuries of “air conditioning” and “rooftop heliport” are mentioned in the same sentence. I am risking a heat stroke just imagining a Texas hotel without air conditioning. But at one time, people had to live with that reality. My how we’ve advanced! The best part about this postcard is that it is unused…so it’s ready to send to a recipient who can also bask in the glory of the 1001-room, Y-shaped hotel!